One word comes to mind as I sit here and look back at 2017 and the adventures I've had with the ExploreVM blog/podcast - Growth. I am thankful to be part of a great community that has provided new opportunities, new ventures, and new experiences. I haven't been nearly as productive on the blog/podcast front in November and December of last year due to some personal matters, getting slammed with work, and the holiday. So, let's kick off 2018 with a review of 2017, and a preview of things to come. For the second year in a row, I was privileged enough to be part of the VMware vExpert program. I often tell people that just because I am a "vExpert", it doesn't mean that I know everything about VMware. And man is that true when immersed in the vExpert Slack channels or conversating with vExperts at events. I've learned so much from fellow vExperts in the past year that I couldn't begin to thank everyone who's knowledge I've grown from. I also took a crack at applying for another community program, and to my surprise I was accepted. I was named one of the 150 Nutanix Technology Champions for 2017. What I like about the NTC program is that it is smaller than similar groups which gives individuals a better experience. There are a great group of technologists in the NTC program which have helped me grow my skill set immensely since I joined. Angelo Luciani runs a great program at Nutanix! As an accompaniment to the blog I've been running for four years, I dove into the world of podcasting. The first season of the ExploreVM podcast launched in February with15 episodes focusing on various topics in the datacenter realm. It's been great to follow the career journey of my guests after their appearance on the show. In January I will begin recording episodes for Season 2, which I plan on kicking off in February. The goal is to publish an episode every two weeks. I'm looking for guests, so please do not hesitate to reach out on Twitter or drop me an email if you want to appear. I'd like to bring on some new voices and perspectives in the next season. Let's explore the datacenter world together! On the blog front, 2017 marked my most productive year with 14 posts. The vExpert and Nutanix NTC program provided lots of great access to products and announcements, which in turn lead to numerous posts. With added posts, comes added readership as well. A bit of a humble brag, but ExploreVM.com saw a 325% increase in hits from EOY 2016 to EOY 2017. If everything I've got lined up works out as planned, including a new website design, 2018 should see the same growth! As we look forward into 2018, I have several posts lined up as a result of Tech Field Day. As we go forward, I see the ExploreVM blog taking more of an analyst route.. However, that does not mean that my event recaps or technical posts are going away, they will just occur a bit less often. Diving into technologies, learning what makes them work, and figuring out where they fit in the datacenter world has become not only beneficial to my professional life, but a very enjoyable aspect of my writing. I have also launched a YouTube channel which I will be publishing videos on various topics. I expect these videos will parallel some of the podcasts, or be informative similar to VMUG sessions. This will be a new venture for me into 2018, but all of my previous podcasts are available there currently for review. One more thought on the content creation front. As growing the blog and podcast is starting to incur some costs, namely hosting, software, and recording equipment, I am considering doing some sponsored content. This would be done in lieu of running ads. I find sponsored content to be less intrusive than ads on sites and podcasts, and when done properly, the posts can have quality content. If your company or product would like to sponsor a post or episode, please email me, or message me on Twitter. The core of my community involvement has always been attending and speaking at VMUG meetings, and 2017 was no different. This year I added Keynote Panel speaker to the resume on top of my usual community sessions. 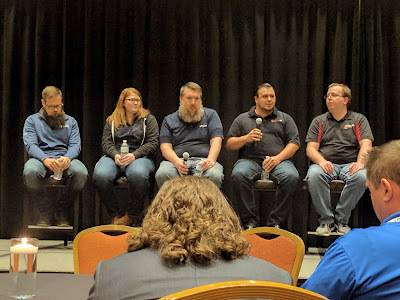 Indianapolis, Chicago, and Wisconsin VMUGs were all gracious enough to allow me to speak at their UserCon's this past year. I take so much joy in giving back to the community that has helped my career explode. If you have never spoken at a VMUG meeting, please consider doing so. Community generated content is always in demand. Many people out in the vCommunity, myself included, are more than willing to coach you on your session. Like I mentioned before, everyone has useful experience, don't be afraid to share. This year had two new speaking firsts. March led off with a pre-recorded webinar that was sponsored by Intel and Nutanix. The recording experience was a touch nerve racking as I had no idea how I looked or sounded until the webinar aired. That being said, I would absolutely do it again. Community involvement led to speaking at two conferences during the summer of 2017. My final event for 2017 was an invitation to Tech Field Day 15 in San Jose, California. What's unique about the TFD15 experience versus my other events for the year is that the delegates get to grill the vendors and learn about products rather than having to speak on a topic. We were either brought to the offices of the vendor, or they came to our location, and we were granted access to everyone from engineers to CEOs. While I am slipping a bit in the timeliness department, look for blog posts about these vendors in the coming weeks. Outside of the Tech, I got to meet, chat with, and learn some amazing folks in our industry. They certainly lit a fire underneath me to do more with myself after spending just a few days in their company. Now, if you'll excuse me, I have to get on to writing other blog posts and working on the website redesign. One last bit of info, I've included some of my goals for 2018, as well as some blog and podcast stats for last year. I hope everyone had a great holiday, and has an amazing 2018. I welcome any feedback on my previous posts, podcasts, or any of the upcoming ideas I've mentioned in this blog. And as always, if you'd like to be a guest or have an idea for an episode of the ExploreVM podcast, reach out to me on Twitter, Facebook, or Email.